Today is September 11, and I'm sad. I hope that the families who lost their loved ones are feeling at peace today. I hope all the soldiers who have gone (and are in) Iraq and Afghanistan have succeeded in making it a safer world for us all to live in. 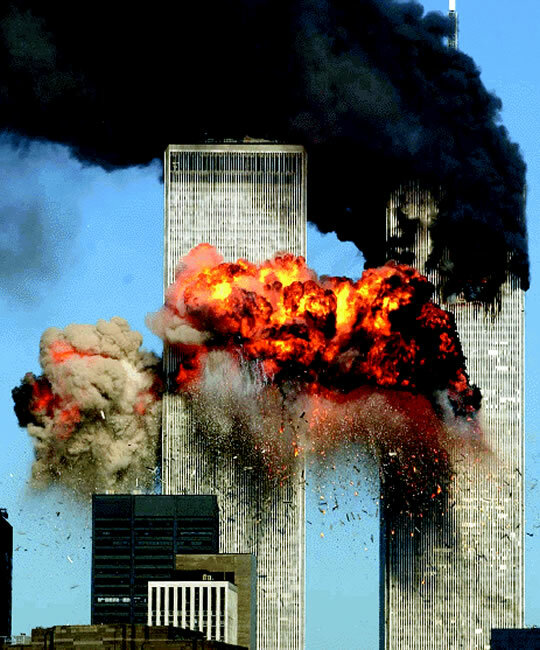 I remember kind of growing up that day, as it was the first time in my life something really, really bad happened. One of those times where I can remember specifically thinking to myself..."there are terrible people out there." It's been 9 years! I can't believe that. I remember exactly what I was doing: I was a sophomore in high school. I was in Mrs. Kohler's English class taking an exam. The principal came on to the loud speaker and said. "We've had a national disaster. Teachers are free to turn on the television in their classrooms." Mrs. Kohler didn't do it and made us keep taking our tests. The next period I went to the journalism classroom (where I was on yearbook staff) and watched in awe. The next day Mrs. Kohler felt terrible and cried in front of us. I felt bad for her. It's a sculpture, art. It is on the verge of poor taste, but I think encapsulates some of those moments. Sadness, exhaustion, and total "oh my god what is happening" shock. In a way that isn't soul-crushingly depressing. The real images are burned in everyone's minds anyway. Thankfully we're all safe today. We were lucky. God bless America. And God Bless College Football....which I'll be spending the rest of my day watching. Seems like the American thing to do. I even will drink only American beer.